Some weeks ago, I put up an article about a meal I made involving spinach taco salad, microwaved sour cream, nuts, peaches, and, um, peanut butter. Readers were horrified. Now I’ve gone and eaten some more strange things for lunch. I didn’t think it to be that strange of a meal, but then again, I didn’t believe that my previous article would be met with such revulsion either, so I guess I’ll find out. This time, I didn’t really have any leftovers except for some bean sprouts from a Hungry Girl mu shu chicken recipe (hey, I eat real food sometimes), but they’re only like 2g of carbs for a half a cup, and I couldn’t think of what I could pair with them. I needed some fiber, though, so I opened up a can of great northern beans and fixed a half cup of them. I left them in the half cup because it was easier than wasting a plate for just some beans. In addition to this, I grabbed the old standby: a pack of nuts and some cheese. I eat a lot of nuts. Like at least one pack of nuts a day. I am nuts about nuts. Okay, they’re good, but I mostly just eat them because I need the calories and protein. Food is just fuel, right? If my various friends over the years have taught me anything, it’s that I am an unfeeling robot, so I think that statement seems logical enough to warrant a complete disregard for meal coherency. 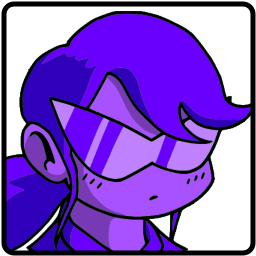 Actually, this isn’t that bad so far. At least, I don’t believe so. I do this a lot: beans with nuts and cheese, or without cheese, depending on my level of desire for extra stuff filling my stomach. So then I grabbed some tuna. It’s ranch-flavoured tuna from StarKist. I considered eating it cold, but I like my tuna warm. I am pretty fond of warm tuna, just so you know. The only problem is that warming tuna warrants taking it out of its package and placing it onto a plate or into a bowl, which is frankly a waste of future dishwasher space. I needed to pair it with something if I wanted to warm it up. And that’s when I remembered the bean sprouts. Bean sprouts and ranch tuna mixed together and heated up for a minute in the microwave made up the entrée, with some sides of great northern beans, mixed nuts, and cheese. 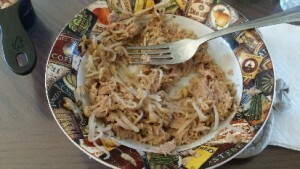 The first thing I tried, of course, was my new recipe (bean sprouts ‘n tuna). It was actually not bad. It was flavourful, anyway. It was different for a change. Wondering if perhaps I’d stumbled upon something that other people might find tasty, I decided to quickly eat some of each of the other things to find out if they went together well. I couldn’t tell. My palate is horribly unrefined. I did notice, however, that the bean sprouts ‘n tuna had a weirder and weirder wang the more I ate of it. It wasn’t, like, a bad wang, though. Just kind of peculiar. After finishing all this, I downed it with a heaping spoonful of Jif whipped peanut butter & salty caramel… peanut butter. It was about two servings. That’s around 3 to 4 tablespoons of peanut butter. That is… okay, that’s an obscene amount of peanut butter to just eat by the spoonful. I must be stopped. All-in-all, it was a good meal. You should try it. Try mixing ranch tuna with bean sprouts and heating it up in the microwave. If you don’t have ranch tuna, use ordinary tuna with ranch sauce (or some of StarKist’s more exotic tuna flavours, like mexican or thai). If you don’t have that, maybe some sriracha? Or sriracha mayonnaise, that might work too. It’s not bad, really. Editor’s Note: Do not be led astray by this trollop. The author’s perception of taste is almost inhuman.